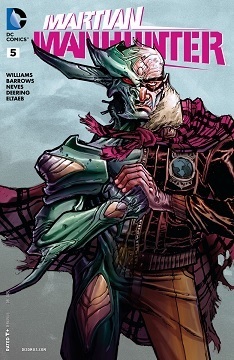 Martian Manhunter #6: "We Are All Different People"
In the 853rd century, humanity has colonized every planet in the solar system. Life exists on Mars once more. So what happened to the last survivor of the planet's previous residents? 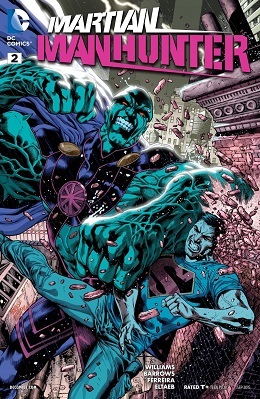 A time-traveling Kyle Rayner learns the fate of a certain green Alien Ace. When it comes to the JLA's 'Big 7'(Superman, Batman, Wonder Woman, Green Lantern, Flash, Aquaman and the Martian Manhunter), being the heavy hitters of the DCU most readers will at least have have a general idea of their origins. All except J'onn. It doesn't help that he has no iconic origin tale like Batman's Year One, Superman's Man of Steel, Flash's Born to Run , Green Lantern's Emerald Dawn and so on. 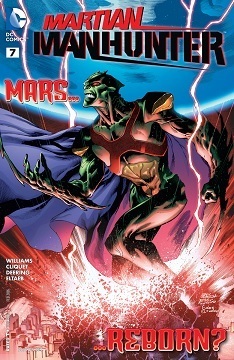 My last couple of posts have dealt with moral issues regarding the world of superheroes, so on a lighter vein, I return to the Martian Manhunter series for a couple of (unintentionally) humorous moments. Earlier I posted scans of the Martian Mahunter's first encounter with Superman. Now it's Batman's turn. Don't worry, he wasn't disguised as Bruce's nanny or something. Theirs is more of a professional acquaintance. Most people seem to forget than not only is the Martian Manhunter one of Earth's most powerful heroes, he's also one of the oldest. 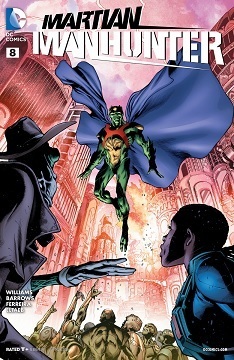 Biologically as well as chronologically J'onn is thousands of years old, and has met pretty much every major hero in the DCU at some point or another. 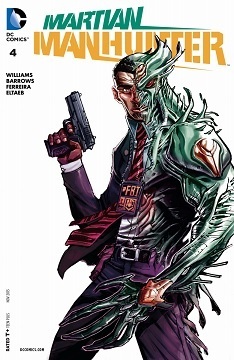 This was briefly explored in the Revelations arc from issue 20 to 23 of his series, written by John Ostrander. 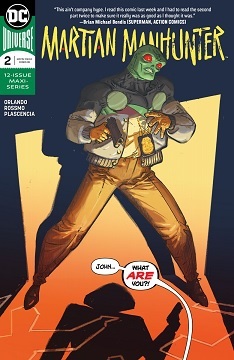 The Martian Manhunter... is a junkie! I know it's like overkill for me to be making three posts on the same day, but I have a holiday with plenty of time on my hands and am mostly spending it reading comics, and have a lot of things I've been bursting to share here for weeks. 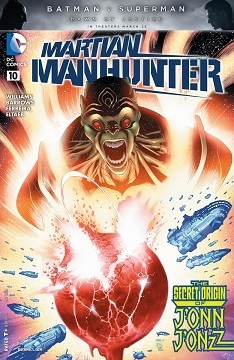 Lately I've been hunting down issues of the old Martian Manhunter comic. 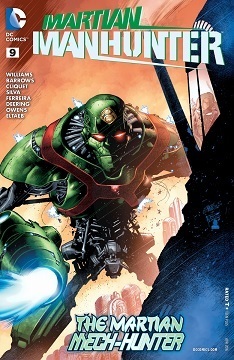 I regard it as one of DC's most underrated series. There are some unexpected gems there. One particularly enjoyable issue is #24 by Ostrander and Mahnke, where Booster Gold and Blue Beetle steal J'onn's cookies. 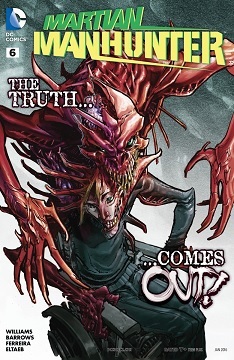 Some scans of this story have already been posted on scans daily before(Just click the Title: martian manhunter tag below, it's the post below this one in the list). 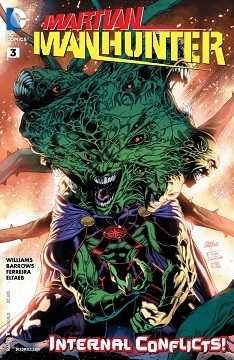 It turns out there's still more hilarity to be found in that issue, after J'onn returns to normal. And does a very passable impression of the Hulk?